This colorful, whimsical vanilla cake has sprinkles inside and out, and just may be the ultimate birthday cake. This recipe is adapted from the book, “Baked Occasions” by Matt Lewis and Renato Poliafito. Martha Stewart prepared this cake on Martha Bakes. Preheat oven to 325 degrees. Butter three 8-inch round cake pans, line the bottoms with parchment paper, and butter the parchment. Dust with flour and knock out the excess flour. Whisk together both flours, baking powder, baking soda, and salt in a large bowl; set aside. In the bowl of a stand mixer fitted with paddle attachment, beat butter and shortening on medium speed until creamy, 3 to 4 minutes. Add sugar and vanilla, and beat on medium speed until fluffy, about 3 minutes. Scrape down the sides of bowl, add egg, and beat until just combined. In a small bowl, whisk together ice-cold water, milk, and buttermilk. With mixer on low speed, add flour mixture in three additions, alternating with water mixture, beginning and ending with flour mixture. Scrape down sides of bowl. With mixer on medium speed, beat for a few seconds to incorporate. Remove bowl from stand mixer, scatter sprinkles across the top of the batter, and fold them in with a rubber spatula. In a medium bowl, whisk the egg whites and cream of tartar just until soft peaks form; do not overbeat. Gently fold egg whites into the batter with a rubber spatula. Divide batter evenly among the prepared pans and smooth tops. Bake, rotating pans halfway through baking time, until a toothpick inserted in center of each cake comes out clean, 40 to 45 minutes Transfer cakes to a wire rack and let cool for 20 minutes. Invert cakes onto rack, remove from pans, and let cool completely. Remove parchment. Place one cooled cake layer on a cake turntable (or a serving platter). Using a serrated knife, trim top of cake to create a flat surface, and evenly spread about 1 cup of buttercream over top. Add next layer, trim it, and frost it as before, then add third layer (trim the final layer for a completely flat top, or feel free to leave it domed for an old-school appearance). Place turntable on a parchment-lined rimmed baking sheet. Frost sides and top with remaining buttercream. 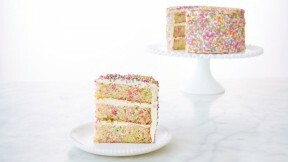 Grab a fistful of sprinkles and turn the turntable with your free hand while tossing the sprinkles at sides of cake. Using the sprinkles that are on the parchment (sprinkles that didn’t stick), continue turning and throwing until cake (including the top) is covered in sprinkles. Chill the cake for about 5 minutes to set before serving. For the Swiss Meringue Buttercream for Sprinkle Cake: Combine egg whites, sugar, and salt in the heatproof bowl of a standing mixer set over a pan of simmering water. Whisk constantly by hand until mixture is warm to the touch and sugar has dissolved (the mixture should feel completely smooth when rubbed between your fingertips). This cake will keep in a cake saver refrigerated for up to 3 days. Bring to room temperature for at least 2 hours before serving.